Born in Lancashire in September of 1972, Diane Nowell (nee Zamorski) grew up in a military family, travelling to locations as far flung as Australia with her father's job. At the age of 5 her father left the forces and the family settled back in Lancashire to be close to relatives, where Diane attended St James primary school followed by Ribblesdale secondary school. In the early nineties, she decided to try the forces life herself, joining the British Army as a nurse. This was a real eye-opener for her and has helped to shape her life since, which has been spent largely in retail management. Diane has always had a love of art but never felt that her work was good enough to be taken seriously. That seemed to change one Christmas, when, stoney-broke, she decided to start painting again for budget Christmas presents. Everyone loved the pop art that Diane created for them, particularly the family portraits and photographs, that she would give her own unique makeover. To her surprise, people started to commission her and that encouraged Diane to start to selling her work. Since then, the orders have flown in. She takes great pride in ensuring that everyone is satisfied with their order and feedback is always welcome. Inspired by some of the famous pop artists of the past, such as Warhol & LIchtenstein, she appreciates the bold lines, bright colours and simple audacity of their work. However, there are many other influences to Diane's pieces, including her art teacher at secondary school who consistently encouraged and believed in her. If you would like to commission Diane or have any queries about oustanding orders, please use the contact form. 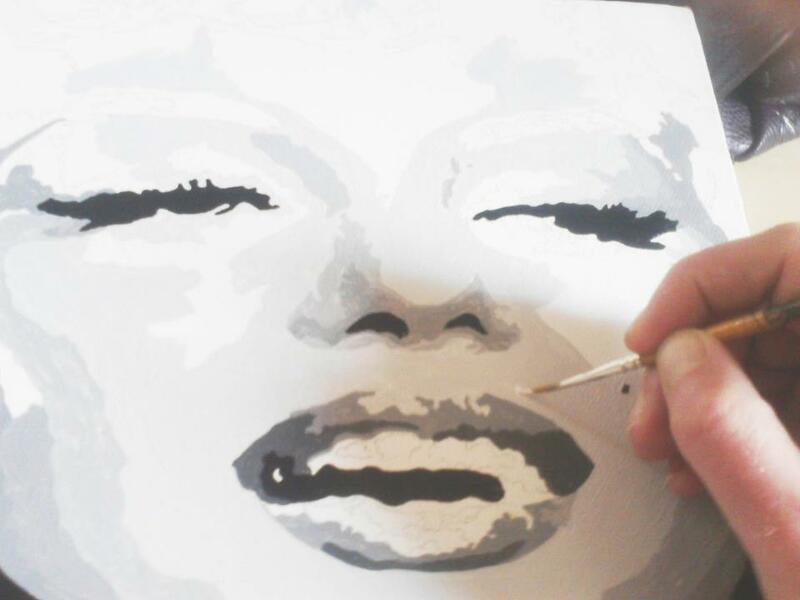 Paintings take around 2-4 weeks to create, and commissions require a deposit to be paid up front to cover materials. This is non-refundable; however, the remaining balance will be subject to a 7 day 100% refund guarantee (excluding postal & material charges) if you are unhappy with the artwork received. Diane prides herself in making sure that every piece of art that she creates is suited to the buyer, and wants to ensure that all customers are satisfied. Her commitment to you is to make sure that you are happy with the artwork provided. All pieces will come signed, with a date on the back of each canvas. Previews of the finished painting (via e-mail) are available on request. A wrapping service and an alternative delivery address faciltiy is also avialable. Naturally, these will incur an additional fee, so please ensure this is specified in the order. All paintings come via special delivery to ensure that they are recieved in pristine condition. "The biggest compliment to my work that I have recently received was from someone who had been given a piece of my art as a gift and then promptly commissioned me to do another. Then there was receiving an e-mail from an established artist in the States requesting one of my works. Oh, and not to forget the piece of work that I have on a dentist's wall in Haverstock Hill London, where all the celebrities go to get their teeth done." Diane exhibits in multiple locations locally (Cambridgehire) and currently has 5 pieces on display in Lafayette, Louisiana (USA). She is also preparing work for more far-flung locations, such as James Harper Fine Art Gallery in Florida. Recently she also received contact from a online gallery based in London (Art Spark Gallery) who are also interested in exhibiting her work.